I count myself as one of the luckiest people ever. I’m 72 and may be the longest lived Degos patient ever. The diagnosis of the extremely rare Degos disease had come with a dawning realisation that I might be about to suffer extreme pain and distress and die within months. In 1997, aged 53, I’d noticed many red spots on my legs and thought they were sandfly bites after a holiday. They continued to appear and to develop white, dry centres. At this point I gave the spots little thought, but after seeing Dr Peter Coburn at Worthing Hospital I began to realise how serious this could be. As a lay person, I hadn’t even considered that spots on the skin might be caused by anything other than an external agent. Degos (also known variously as Kohlmeier disease and as malignant atrophic papulosis) is an obliterative vasculopathy. Cells in the walls of small and medium veins and arteries swell and close off the blood vessels. Where this happens under the skin, a tiny thrombosis forms and cuts off the blood supply – hence the appearance of lesions. For some people, the disease progresses to involve the central nervous system, the gastro-intestinal system, the eyes and many other organs. This may occur quickly, or may happen after some years of skin-only manifestation. (In the past few years it’s been tentatively suggested that maybe there are two forms – one which follows a benign course, affecting only the skin, and a more deadly form, with systemic involvement). Dr Coburn was one of the few dermatologists in the world who had not only heard of Degos, but could recognise it right away. Biopsies confirmed the diagnosis and a further referral to Dr Robin Russell-Jones at St John’s Institute of Dermatology (St Thomas’ Hospital) led to years of attempts to slow down the disease. As I had elevated levels of CD4 and CD8, the most effective treatment I had was an immune suppressant (ciclosporin A) but many other attempts were tried to halt the advance of the disease, including chemotherapy, and 26 other drugs and approaches, which are listed at http://www.degosdisease.com/info/treatments. However, the lesions were still appearing fast and I now had hundreds all over my body especially on my legs, buttocks and arms; some were coalescing and breaking down so ulceration was now a big problem. Five years after diagnosis, I was covered in deep ulcers and frequently getting infections along with struggling to tolerate the many medications being tried with little success. Immune suppression was slowing the appearance of new lesions, but a week in hospital for i/v human immunoglobulin infusion gave me a little extra – MRSA. Twice. By now, I was in and out of hospital being treated for the sores, although with minimal success. At home, my wonderful friends the district nurses were visiting daily and trying all kinds of interventions to help heal the deep ulcers, mainly on my feet and legs. The whole of the tops of my feet were huge deep ulcers. Dr Coburn was beginning to worry about possible amputation, and also mentioned trying stem cell skin grafts (very new tech then). I had no areas of healthy skin to consider normal skin grafts. I’d heard of manuka honey and its extraordinary antibiotic healing powers so asked if we could try it topically for a fortnight. Debridement began within days, and at ten days the wounds were healing well. We followed it up by pouring vitamin E oil directly onto the healing skin and this finished the job beautifully – scar tissue formed and although you can’t call my feet beautiful, I can now wear normal shoes. One nurse practitioner was so thrilled at the swift effective response that she later based her PhD thesis on the case. Now manuka honey is available in dressings through the NHS. There was nerve damage by now, and morphine wasn’t effective. After several trips to see marvellous Dr Nandi at the pain centre at the Hospital for Neurology and Neurosurgery in London, and attempts to overcome the pain with various approaches, it eventually was tamed by long infusions of ketamine. The hallucinations which are a terrifying side effect were eventually calmed with the help of a tranquilliser at the same time. Degos has no aetiology. It affects individuals of all ages and all races. There are less than fifty patients known of worldwide. Babies and very young children have died, as have older, otherwise healthy adults. At the beginning, I was told not to look on the Internet for information. Well, I did. Pretty much all the mentions were of post mortem cases, curiosities for doctors, but offering little insight into cause or effective treatments. I was also told that I might be the only Degos patient in the world. This sounded ridiculous to me, so I set out to see if I could find anyone else. As time went on, the website I’d set up gradually attracted a handful of patients. My husband Alan and I set off to meet them in Germany and the US) and around the same time I was being examined by doctors (mainly dermatologists) in various hospitals – in London (Royal School of Medicine), Pittsburgh (Allegheny General), Boston (Mass General), Cape Town (Groote Schuur), Berlin (Charité – Universitätsmedizin) – in the hope that they might recognise the disease if they met it again. I can tell you, it’s a lonely business, being poked and prodded and examined as a medical rarity. I felt like the Elephant Man. Degos usually manifests as skin lesions, but can also be identified first by ophthalmologists, neurologists or gastro-enterologists, so the literature is spread across disciplines. My degosdisease.com website is the first attempt to collate all information on the disease, so that it acts as a resource for medical professionals as well as a support network for patients and their families. Another wonderful thing happened – Professor Christos Zouboulis, a Greek dermatologist working in Germany, asked me to become a partner in his setting up a centre of excellence for Degos disease. He was already working with Behçets patients and their charity funded some of the work. We held the first ever Degos conference in Berlin in 2007, and had six patients there – no doctor had ever seen as many together. A biobank was set up, and Prof Zouboulis engaged a colleague of his at NIH to set one up there too. (There is now a growing group at NIH engaged with Degos work). Meanwhile, a five year old boy in Boston was dying. His doctor, a rheumatologist, Dr Patrick Whelan, was so moved by this situation where he was powerless to help, also became involved in the – by now international but tiny – group of concerned medics determined to know more about Degos disease. We had a second Degos conference in Boston in 2009, held in the oldest operating theatre in the US. I raised enough funds from family and friends to bring several patients to Boston to meet the doctors. All this time, the lesions were still active on my body. I was still suffering pain and feeling ill from side effects of the drugs I was being prescribed. The outcome was still unclear. I simply felt that it was vitally important at least to make more doctors aware, as there must surely be a large “grey number” of undiagnosed patients, especially in areas of the world where access to information on the Internet is restricted. Each of the doctors and nurses I’ve met in the course of these years has had an impact on my life. This seems pretty obvious, I suppose. But the one who insisted on telling me he could be curing four people in the time I’d been with him and that I was expensive for his practice, and to go home and bathe in Dettol – set me back some way. I hobbled away from his negativity. Finding Dr Charles Shlosberg (GP) in Rustington, Sussex, was a major turning point in my recovery. His support has been life changing and my husband and I will be for ever grateful for his empathy and professionalism. The district nurses and those in various dermatology departments (I’m estimating at least 40) have, without exception, shown great compassion and kindness. It means such a lot. Now, at Steffens Scleroderma Center in NY state, a rheumatologist, Dr Lee Shapiro, is setting up a non- profit organisation which specifically includes Degos disease. Dr Cynthia Magro, Professor of Pathology and Laboratory Medicine at Weill Cornell Medical College suggested eculizumab (Soliris) for a Degos patient in NYC. The first miracle for Dr Shapiro was learning of this three weeks later when his patient was deathly ill. One year later, despite ongoing eculizumab, he had disease progression. The second miracle was when a woman with scleroderma and Degos was placed on treprostinil for pulmonary hypertension and came in three months later to report her skin lesions had almost resolved, though that was totally unanticipated. Dr Shapiro got the medication for his young patient and he too responded. The turnaround was so stunning that the doctors describe it as a life altering event for themselves too. Dr Shapiro now has four patients on combined treprostinil and eculizumab, all doing well: well enough to finish college, work, even get married…..they are all working. Degos is one of the rarest conditions in the world; eculizumab (Soliris) is the most expensive treatment in the world, at nearly £350,000 per patient per year. How ironic – and utterly tragic for those seeking help. Imagine the reaction of any commissioning health authority, faced with this. Alexion make Soliris for less than 1% of this cost. I wish I knew why Degos disease apparently burned itself out in my case. I have healed scars, no pain from the disease and am living a normal life. If only that could be said for those whose disease progressed to a systemic form. No-one yet knows why some seem to have the benign form, when others develop lesions in their GI tract, CNS, eyes or bladder and who then face a very poor prognosis unless they are millionaires and can afford the unacceptable cost of the treatments known to alleviate the symptoms. 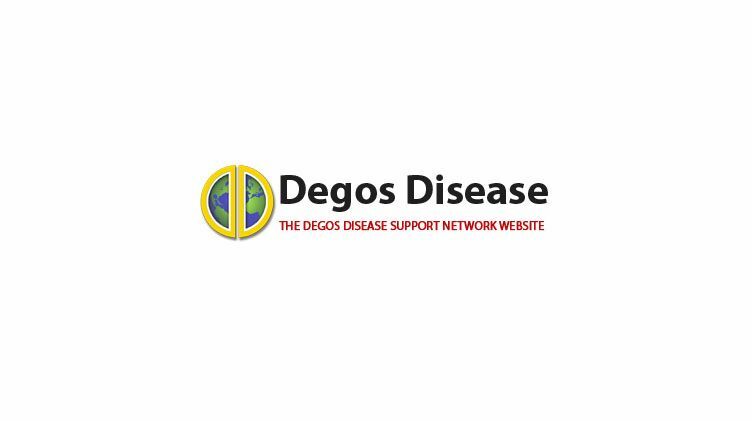 degosdisease.com now exists as a hub for information, support and contact, for patients, carers and medical professionals, wherever they are. There are links to papers, images and videos of presentations, as well as forums for patients and doctors. After July 2016 I will be able to add more, as we are planning a conference in Saratoga Springs, NY, with specialists and patients attending. Now a public relations firm in Saratoga Springs with a mission of developing communities of individuals with rare diseases have become new partners in the work, taking on assisting the Degos community as a pro bono project: after years of lonely slog, perhaps the time has come at last when I can hand over the reins of Degos patient support to professionals.